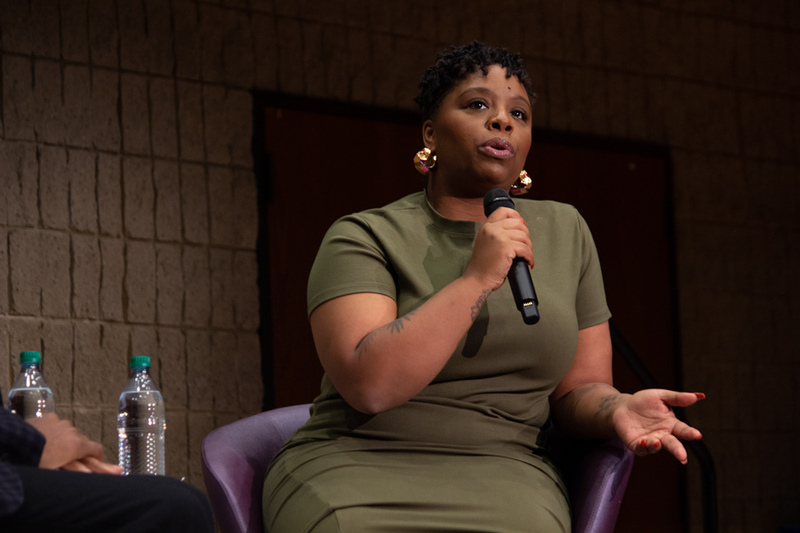 Black Lives Matter co-founder Patrisse Cullors said she decided to write her memoir after noticing that other books about the black experience focused on individuals rather than the wider narrative. “This is a story of collective surviving,” Cullors said. Cullors spoke to over 250 people at a Thursday event in Norris University Center, introducing her book “When They Call You a Terrorist: A Black Lives Matter Memoir.” During the event, part of Alice Kaplan Institute for the Humanities’ Dialogue series, she said her memoir was meant to be a larger story about black history in the United States. Cullors said she wrote her book, published in January 2018, in response to the Black Lives Matter movement being called a terrorist group in the media. She was initially apprehensive about writing a book but said that the backlash against the movement changed her mind. In 2017, the FBI’s counterterrorism division referred to members of the Black Lives Matter movement as “extremists.” Cullors said she felt the need to counteract the movement’s negative portrayal. “There needs to be more than just sort of media clips,” she said. Maya Lennon, a first-year Ph.D. candidate in the School of Communication, read Cullors’ book previously and attended the event in hopes of hearing more stories of Cullors’ personal experience. Cullors also discussed her art, which she used to articulate her brother’s experience of being abused while incarcerated in a county jail in Los Angeles. Cullors’ piece involved actors exercising and crying to represent the physical burden of incarceration while other performers pasted copies of a complaint from the American Civil Liberties Union detailing the abuse. Jumie Taiwo, a Chicago resident, said she attended the event with a friend because she wanted to hear from a leader of the Black Lives Matter movement. She added that it was exciting to see Cullors focus on art during the conversation. “It’s hard to see a purpose in what you’re making when, all around you, everything is burning,” she said. Cullors rounded out the conversation by discussing the intersection of misogyny and the Black Lives Matter movement. Cullors said she, Alicia Garza and Opal Tometi originally shied away from the title of “co-founders” and taking responsibility for creating the movement. However, when people began misconstruing the movement as focused on the struggles of black men, they felt it was important to take full ownership. She described the recent documentary “Surviving R. Kelly” as an “important entry point” into the conversation about black men’s duality of being both oppressed and oppressive. Cullors ended the dialogue by leaving the audience with a piece of advice about mental health. “Work hard for black people, but also work hard for yourself,” she said.